Activists entered the NCIG coal terminal site in Newcastle before dawn to peacefully stop construction of new coal port facilities. 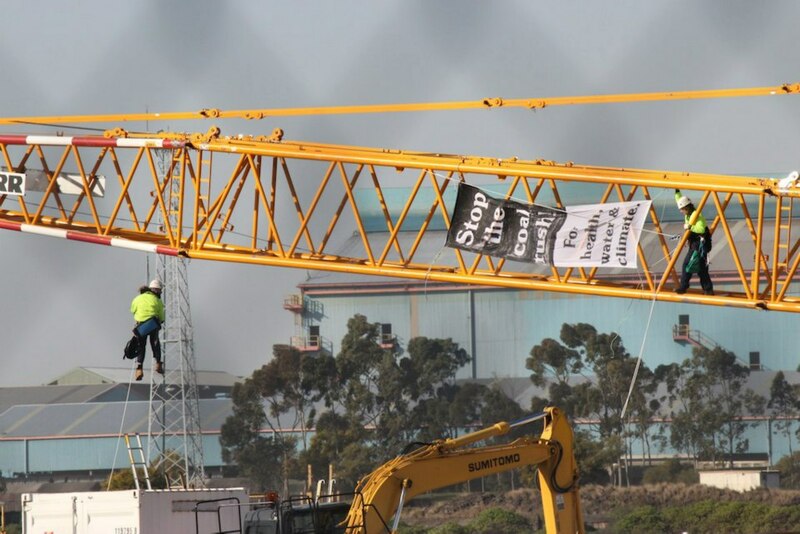 Two experienced climbers scaled the 60 metre high construction crane to unfurl a banner reading "Stop the coal rush! For health, water & climate." The two activists were both arrested and charged with 'enter enclosed land'. They have now been released and will appear in Newcastle local court on 9th October. Both activists have been reported as safe and well, and are happy with the protest today which stopped work on the coal port terminal site for two hours. The protest was the fourth consecutive stop-work action against NSW coal projects this week. Activists targeted expansions of the three major elements of the coal chain – mines, railway, and port infrastructure – to highlight the massive expansion of coal mining and infrastructure taking place in NSW, and its impacts on public health and the environment. "Enough is enough. We need to stop the coal rush. It's time for State and Federal governments to stop kowtowing to the mining companies, and get behind community demands for a clean, renewable future." A spokesperson for Rising Tide Newcastle said the actions of police today which imperiled the lives of two activists will be reported to the NSW Ombudsman. 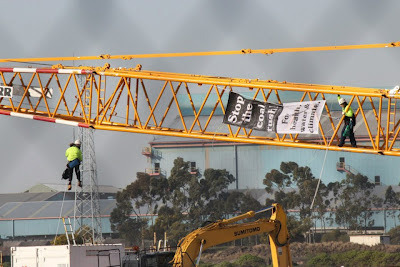 On Monday two activists did a banner drop in central New South Wales, where activists scaled a coal-crushing plant at Boggabri Coal Mine on the Gunnedah basin. According to a media release by the protestors the NSW Government has recently approved a fourfold expansion of the Boggabri Coal Mine. The two protestors dropped a banner saying: "Stop the Coal Rush: Protect Health, Water, Climate". After more than 8 hours atop the coal-crusher two protestors were arrested and taken to Narrabri Police Station. The men were protesting against the destruction of Leard State Forest, in the Gunnedah Basin, for three open-cut coal mines. A major expansion of the Boggabri coal mine was approved by the NSW Government in July despite community and environmental organisations alledging huge ecological impacts and overwhelming community opposition. At the same time on Monday activists from Quit Coal dropped a huge banner over the the Victorian State Parliament entrance saying 'Coal is the single greatest threat to civilisation and all life on our planet' Prof. James Hansen, NASA. Why is Baillieu funding coal?" Between today's protest and the protest at Boggabri coal mine Rising Tide Newcastle also protested on Tuesday the upgrading of rail infrastructure and building a third track in the Hunter Valley to increase the load capacity for exporting more coal. The Maitland to Minimbah Third Track project is being constructed by Hunter 8 Alliance, which is a consortium of engineering company GHD, construction company John Holland, and the Federally owned Australian Rail Track Corporation. The project aims to lift coal haulage capacity on the Hunter rail corridor to 200 million tonnes per annum. It includes construction of 23km of new rail track, and reconditioning of 9km of existing track. The Federal Government granted $114 million, through the ARTC, to the project. 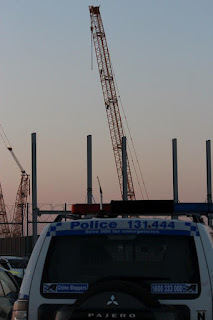 Activists accessed a Hunter 8 Alliance site at Rutherford and erected a wooden tripod to block access to the site. Activist Ned Haughton scaled the 10 metre high structure, where he remained for the next five and a half hours. Haughton was arrested and charged with obstruction. On 5 September Energy Minister Martin Ferguson announced that the Government has abandoned its commitment to shut down some of Australia's dirtiest power plants. The scheme, called Contract for Closure (CFC), was designed to close stations like the infamous Hazelwood brown coal plant, by paying out the commercial operators. Instead, the program's been scrapped because coal-fired generators remain so profitable that they think their assets are worth more than what the government was willing to pay. What's particularly hard to swallow about the breakdown in negotiations is now the most emissions-intensive generators are free to continue polluting – and be paid for it, to the tune of $5.5 billion in taxpayer compensation. Hazelwood alone has already received $266 million to continue polluting. It means that owners of Australia's most polluting generators are being propped up, at our expense, while they continue business as usual. To put this $5.5 billion into perspective, the current compensation is more than enough to fund the full recommendations of the Gonski review into education. It is a massive figure and spent wisely it could do enormous good and reform our ailing public education system. A recent poll commissioned by GetUp showed the majority of Australians supported the decommissioning of the worst polluters in the energy industry such as the Hazelwood power plant in Victoria and the Playford power plant in South Australia. Australia is still on track to meet our 5% emissions reduction target despite yesterday's announcement. But we have to do far better than a meagre 5% reduction if we are to do our part in stopping dangerous climate change. Failing to close the worst polluting coal plants makes it even harder to increase the ambition of Australia's climate action in times to come - and every megawatt of power coming from these high emissions plants is just one more obstacle on the path to the strong renewable energy future we've fought so hard for. PS - This announcement means it's more important than ever that we support existing on-the-ground campaigns in the communities of the worst polluting plants. From Hazelwood in Victoria to Playford in South Australia, local groups are organising rallies, petition deliveries and walks to encourage a fast and smooth transition from dirty coal to thermal solar driven power. We'll be in touch next week about ways in which you can contribute to these critical campaigns. 'Burn on: PM's dirty power buyback plan up in smoke', Lenore Taylor and David Wroe. The Age, 6 September 2012.